Next time you open the hood of your ultimate driving machine, be greeted by a clean and impressive engine bay. We start with a straight and true OEM valve cover... clean, strip, and media blast it. Studs and/or mounting fixtures are removed and covered, as well as all sealing surfaces. We then High-Temperature Paint or Powder-Coat the cover in your choice of colors for a handsome finished product you will want to show off, we remove and finish excess coating around raised lettering for that classic look. 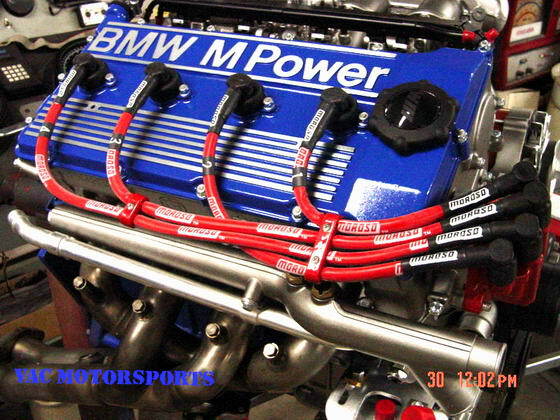 This is a great way to brighten up your dusty/oily engine bay, or go back to an OEM look without any dirty work. Powder-coated finishes are resistant to oil, gasoline, and other under hood contaminants for an engine bay that stays clean and tough. Send us in your core valve cover for a refund after you have received your new one that looks brand new! No down time! Powder coat in: Gloss Black, Bright Red, VAC Motorsports Blue, gloss-finish silver (+$30), others on request. Paint in: Wrinkle finish Black, Old School Orange, VAC Motorsports Blue, others on request. Please allow additional turn around time for this service. An additional charge will be applied for the gloss silver-look finish.